Rules for "3 cubes in line"
The players have to place the pieces (cubes), one by one, in any of the ducts (holes), trying to obtain a line of three cubes, horizontal, vertical, or diagonal, of the same color. The winner will be the player who makes the most "3 in line" chains. As a particularity of the 3x3 cubes version, the player who placed the central piece, which can became hidden during the game, must claim that saying "central". The rest of the pieces are completely visible during the game. Rules for "4 (or more) cubes in line"
The players have to place the pieces, one by one, in any of the ducts (holes), trying to obtain lines of four cubes horizontal, vertical, or diagonal of the same color. The winner will be the playerone who makes the most such lines. This version can be played by two or more persons. 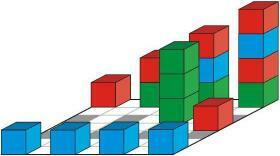 The players have to place the pieces (cubes, rolls), one by one, on the colored spaces of the game board, trying to obtain lines of four pieces, horizontal, vertical, or diagonal of the same color. When has finished a complete line, the player has the right to take an opponent's piece, following the next rule: only the unused pieces and the last pieces on the column can be captured; a complete 4x4 line cannot be broken. Capture of the pieces is possible only in a two player's game and must be agreed at the start. The winner will be the player who makes the most "4 lines" or who has captured the most opponent's pieces.